Samsung’s latest innovation, the Galaxy M20, is now availabile. The Samsung Galaxy M20 runs on a whopping 5,000 mAh battery, its largest in the mid-range category. Users will worry less as they can make calls for 29 hours, play videos for up to 17 or and listen to music for 101—all by charging once. When the battery does run low, the Galaxy M20’s fast-charging feature can power the device up to 10% in just 10 minutes. Its Phase Detection Auto Focus is quick and accurate and ideal for fast-moving and distant subjects. The Galaxy M20 camera comes with an AI-solution to optimize scenes in real-time, and automatically adjusts saturation, white balance, and brightness. Selfies can be elevated with stickers, stamps, and flattering filters, for professional-looking images. All of the features are integrated into the Galaxy M20’s FHD+ Infinity V-display. This offers an uninterrupted viewing experience with a 6.3” edge-to-edge display and a 90% screen-to-body ratio. It’s an immersive device that will delight users who love to play games, stream content, browse, multitask, and more. It is complemented by a slim glossy back, and two color choices: charcoal black and ocean blue. 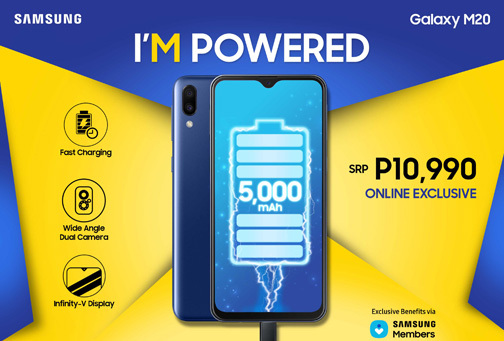 The Samsung Galaxy M20 is available starting today with a suggested retail price of PH10,990.00. It is exclusive from online merchants Lazada, Shopee, Argomall, Abenson, and MemoXpress. Users may visit the online merchants’ websites to know more about their promos with the Galaxy M20. Each purchase of the smartphone also comes with access to the Samsung Members app, an online community that offers news, tips, diagnostic checks, and exclusive benefits like event invitations, special offers, and discounts on Samsung services. Xiaomi PH holds 3rd Fan Meet at Market! Market! Go all out on TikTok for just P15/day with Globe!